1. facebook, google and everything keep changing so fast that I can't keep up. my grandma doesn't even try to use the internet, and I'm afraid that I'm destined to follow in her footsteps. I no longer have any idea how to sign into things, alter settings, recover my password, etc. Sometimes a product is good enough. stop changing it! 2. My own self-consciousness. It was scary to write that stuff yesterday, especially when I looked online and saw a lot of views (compared to the rest of the time). But I'm happier being myself and I feel like I'm a reasonable human being and I have a right to be heard just like all the other people out there (and a lot of them aren't even reasonable at all). So despite my panic attacks, I will keep the post on there. Please don't burn my house down. Anyway, I think it's time...for another graphic picture of my tonsillectomy aftermath!! kudos to Brandon for taking this picture with a cell phone camera. I like how my normal-sized uvula reflects the flashlight I'm holding to make this moment possible. 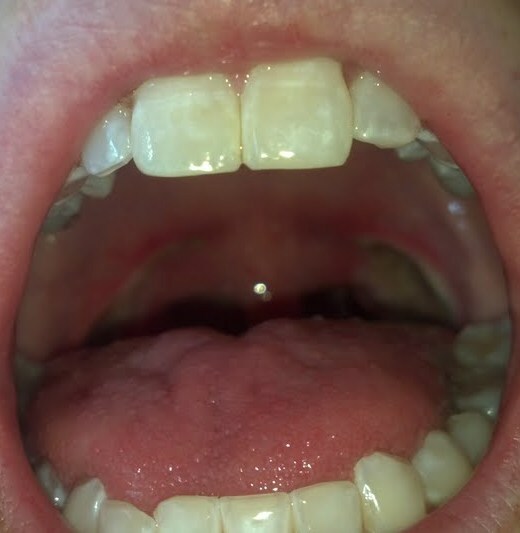 Oh--my poor tonsil holes are real red around the edges! You can see the scabs inside. there's a dark part inside the one to the right--I am going to assume that's normal. Also, you can see how the taste buds closer to my front teeth are inflamed. Just so you know, it still hurts to open my mouth like this, so never say that I don't suffer for my art. So today is DAY 7 post-op. I should note that I've been counting the day of surgery as Day 1, primarily so I would feel like I was getting through it faster. I've decided that the very, very worst part about getting your tonsils out is the information available online about getting your tonsils out. For every story about an easy, standard tonsillectomy that takes the suggested 10-14 days to completely heal, there are approximately ten million horror stories about people who CAN NEVER BE HAPPY AGAIN! I would literally quake in terror at stories of people vomiting up blood clots and pain more intense than childbirth and severed nerves and loss of taste and tongue numbness and all manner of mayhem and terror. But I think my experience is probably more typical, and even the sites that have information about the typical experience don't go into much detail, so I will! Day 3: I hope I mentioned that I'm taking antibiotics every day. I'm taking pink goop amoxycillin as a preventative measure to stave off infection (is that redundant?). I remember taking it as a kid and loving it. I still do. Which is good, because it's about the only thing I can actually eat. I am sooo hungry. But the crappy thing is that I haven't lost any weight, and in fact, have put on a pound. The other thing is that I have tummy troubles as a result of my Percosets. While I could talk for the first little while after the surgery, by now it is really painful, and I communicate a lot by writing on notepads. I also found this site called ispeech.org that has a demo for it's natural speech text-to-voice application, and so when I talk on the phone, I use that. It has a word limit of like 20 words at a time, though, which is rough, and then I'm perpetually behind on the conversation. My parents will ask me a question and I'm still in the middle of answering the one five minutes ago. The pain isn't too bad. About a 4 out of ten when the pain killers aren't in force and a zero out of ten otherwise. Today's horrible life or death ordeal was that my mouth tasted like yeast inside! It was gross. It didn't help that I hadn't brushed my teeth since the surgery because I was afraid my vibrating toothbrush might slip and rip open my stitches and then I would painfully bleed to death on the bathroom floor. Everything I ate tasted gross like my mouth and I was even more upset when Brandon suggested I might have thrush, which I had only heard of as an STD before. It turns out that thrush is not a classic STD but can result from many different things, including infection. Your throat will be coated in white stuff if you have thrush and it's supposed to be pretty painful. That's when I started hitting my acidophilus tablets religiously. I also gargled with salt water (okay, I was too lazy to make salt water, but I gargled with water and that's at least half the battle). I gargle now each time I brush my teeth, and I think that and acidophilus and drinking a TON of water have helped. The taste was mostly gone by the end of the day and by now (day 7), is completely gone. Day 4: I was so hungry today and I actually felt like I could eat! I ate the leftover chicken biryani (it was very mild) and it felt so good to have real food in the old system! The pain was a little worse today than yesterday by the end of the day, but by far the most alarming thing was waking up after a long day's nap with a horrible feeling of a lump in my throat. After much online research, I determined that I either had an inoperable, huge, fatal, but very slow-moving embolism in my carotid artery, or I was having some GERD. I don't know what that stands for but it's basically acid reflux that manifests itself as a lump in the throat. I read a couple of other people that had that same feeling, but I don't know if they just felt that way about their swollen uvulas or if they had the same thing I did. Before finally settling on GERD I totally thought I was going to die. It felt like I was slowly choking or suffocating. I felt like I would have it for the rest of my life (thanks to the yahoo answers people whose lives have allegedly been destroyed by this surgery). I finally remembered the admonition to drink a ton of fluids and I did. And I started to burp. And the more I drank, the more I burped. I think it's gross to burp, especially out loud, and I try never to do it when other people are around. Brandon's dealt with grosser, though, and the relief was so immediate that I probably would have done it in front of the Queen. The lesson we should all be getting from this is there is no such thing as drinking too much liquid after a tonsillectomy. Day 5: I ate almost nothing today. The pain racheted up significantly from Day 4, which seems consistent with what I've been reading. It is supposed to peak between days 5-7, though some people say Day 4 is the worst, and some people say Days 6-9 are the worst. I am hoping it doesn't get much worse than this. I got in a fight with Brandon and wanted to make him feel sorry so I made him dinner and did the dishes while he was taking a nap, even though I was sick. We worked it out, with both sides expressing their feelings and wishes for future behavior. (this is hard to do when you can't talk that well). I'm using my computer voice off and on today. Sometimes my real voice is okay, but it's high and whiny. I napped for basically the whole day before the dinner and dishes thing, and my housekeeping venture was probably a mistake. I find that I keep wanting to do things, and most of my body feels ready, but physically I really do still need to wait. The pain this evening is the worst so far and I just want to curl up in a ball and go to sleep. It's about a 6 out of 10. I've gotten addicted to playing this stupid phone app when I'm waiting for my pain medicine to kick in. It seems to help me get through it, but I want to delete it as soon as I'm better. Today's strange new symptom was a really dry throat and mouth. I ran out of gatorade, but drank more than a gallon of water, and it didn't help at all. Brandon was kind enough to get me a huge crate of gatorades and that made a lot of difference because it helped shore up my electrolytes. The Low calorie gatorade is helpful for right now because it has the electrolyte benefits, but few enough calories that I can drink a ton of it every day. It helps keep my throat lubricated and that really eases the pain. Also, with the huge amounts of tylenol I've been taking, I feel better about the state of my liver. The big problem tonight is that I am almost out of my Percosets. (my computer voice calls them pur-COSS-ettes). If this is just the beginning of the worst pain, I need more pills. Hopefully I can contact my doctor tomorrow. Until then, we're rationing the Percosets. (Even as I type this, I say pur-COSS-ettes in my head.) Also, I've started swallowing my pills whole. It is so much better than crushing them and choking them down with apple sauce or something. Day 6: Ouch. Today the pain is in the 6-8 out of 10 range, but the main problem is that there's not much of a respite. I'm really starting to feel the fact that I haven't eaten enough food in almost a week. I wonder if my thyroid is shutting down because I'm freezing cold all the time. I ended up taking three showers today, and just sat on the shower floor letting the warm water run over my body. First thing this morning I called my doctor's office. I asked the secretary to please relay the message that I need more medication. I'm afraid my doctor will think I'm a drug addict looking for a score. The secretary takes my message and casually slips in, "Oh yeah, she's not in the office today. I'll leave a message for her, but hopefully she'll be able to fill it tomorrow." I am crushed. I start taking one percoset at medicine-time instead of two, and it's really a lot less helpful. It seems to wear off faster, too, and I find myself furiously playing the bubble game for an hour and a half at a time until I get a little relief. I finally take a nap and when I wake up, I have a message from my doctor's secretary. My doctor has called in a prescription for Vicodin. I am saved!! It does not help as much as the Percoset, but I'm so relieved that I don't have to go it alone! This is a PAINFUL recovery. BUT--even though I'm not done yet, I still think that the surgery will prove to be worth hit. It is horrible being debilitated by severe sore throats at least once a month during the winter/spring. Every bug that was going around seemed to latch onto my tonsils and go to town. I'm feeling really sorry for myself, and I keep reading that tonsillectomies are the most painful recovery of any surgery, so finally I google, "most painful surgeries." I find a message board where people are comparing battle scars--having kids without an epidural, shoulder surgery, chemotherapy--and I realize that even if I have a couple of bad pain days, it is nothing compared to what a lot of people are going through and I need to man up. Some people have claimed that their tonsil pain on recovery is worse than childbirth. I've never had a child, but for me, I don't think that's true--though it's hard to compare pain in different parts of your body. This night is really bad. I fell sort of behind in my medication today, what with my rationing, and so the pain got a real foothold. Around 2am, I burst into Brandon's room (we've been sleeping in separate rooms since I'm sick and he can't take noise and I move around a lot and snore and stuff) and pitifully whined, "it hurts sooo much!!!" Lovingly, he spread his arms and said, "come here." I crawled next to him in bed. Or at least part way. Because he was spread-eagled in the bed, and he did not move his body at all. So I was scrunched half-on and half-off the bed. I snuggled close to him and started to talk about the pain but every time I did, he'd gently and lovingly say, "shh..." in a comforting way. It was super aggravating and I left after about a minute. Which I think was his goal, though he acted surprised that I was leaving already. Oh, a side note--my usual level of crying is really high. I probably cry at least once a day. It's not that I'm a particularly sad person--I just think that that's my emotional balance. But since my surgery I think I've only cried once, but not because of the pain. I think it would hurt too much to cry, but I could be wrong. That seems like emotional growth, but I can tell that my sinuses miss their daily cleansing. It makes me want to cry just thinking about it! We also watched the super-awesome video of that race-car driver in the Daytona 500 crash into the jet-engine dryer. Look it up. It's awesome--especially since no one got seriously injured. Day 7 : Today!! This is a really long blog entry! But I want people who are contemplating a tonsillectomy to have a lot of information from someone who's been through it as an adult, so they know that it's painful but should be beyond what they can handle. Every person is different and every person's pain tolerance is different. Today the pain was a little better. The broad white patches in my throat have narrowed down to slivers where my tonsils were. These are the scabs and they should be breaking off and being swallowed (gross!) over the next couple of days. The period of starting to lose and losing the scabs is supposed to be the most painful, and so I'm happy to say that the pain overall was better today. My voice sounds a lot better, though I still feel like I sound like one of those kids that was raised by wolves in the jungle and is learning to speak for the first time as a teenager. There are still periods of a lot of pain. Generally it's about a 3-4 when my medication is mostly going full steam, but it's still a 6-7 when the medication is wearing off/wearing on again. A lot of the pain (for the past couple days, too) is referred to my ears so it feels like I have an ear infection or something. It is uncomfortable to talk, and swallowing feels a little worse compared to days 3-4, but I'm following my favorite rule: hydrate! hydrate! hydrate! which as always, makes things better. There has never been a moment today where I haven't had a cup of water or a bottle of gatorade with me. I always sleep with a bottle of each by my bedside for the middle of the night. Today I swallowed my huge multivitamin whole! That sucker is an inch long! With my uvula now normal-sized, I figure it's safe to try. I also brushed my teeth more thoroughly than I had since last Wednesday morning (I'm totally lying--I did not brush my teeth before going into surgery--is that rude, since they were working on my mouth?). Right now I'm in a pain transition phase (which is my delightful euphemism for when the last pill wore off and the next one still hasn't brought me up to speed yet) so I'm not that happy, but I'm still dealing with it like a champion! Also I ate today. A lot! I had oatmeal for breakfast, mac and cheese for lunch (that didn't work out all that well--it seems like it would be a good recovery food, but I cannot endorse it because something about it just doesn't feel right...) and...went out to dinner! I was craving a pizza so bad so we went to the little pizzeria and got a mushroom-heavy pizza (they are squishy and delishy!--how cute was that? and how apparent that the medicine is starting to kick in!) AND a salad WITH CROUTONS!! And it all went down great! I do wonder if I'll have another lump-in-the-throat situation tomorrow. I took some time to make myself feel clean and pretty again. I washed my hair (I only took two showers today!) and plucked my eyebrows, and did a mud mask. It felt really good. So hopefully the pain will continue to improve. I am ready to get on with my life! Oh, also, the new symptom for today is that my taste buds feel really tender, and the front of my tongue is sore. I've heard other people online say this is from the mouth holder opener thing, but it seems weird that after 7 days it would only finally start to feel an impact now. Though I am in the "throes of agony" part of tonsillectomy recovery, I hope that my experience will provide some realistic expectations for the surgery and recovery. On all the horror-story blogs, I read comments by people who need a tonsillectomy but are thinking about backing out based on what they've read there. Just remember that this is a surgery that has been done probably tens of millions of times--this isn't a procedure that has never been done before that they're going to name after you--if you survive. This is a minor surgery, and though there's a risk of complications, the odds are very much in your favor to have a normal experience. Man, the life or death experience for today just happened--this page just froze. I was so sad! I thought I would lose this huge opus. When my uncle first heard I was moving out to Cleveland, he said that once, he was traveling for business and stopped over in Cleveland on a Sunday. He attended a branch there and it happened to be fast Sunday. The first member got up to bear her testimony and in a sonorous voice, declared, "I have a grievance to bear..."and proceeded to excoriate the congregation. The next member arose after her and upon reaching the pulpit, pronounced, "I too have a grievance to bear..." and said his piece. Apparently it went on like that for quite a while. Well, today, I have a grievance to bear. Actually, I have a list of grievances. I am still in a very huge amount of pain from the surgery. This is been the worst day so far. Post-op days 6 and 7 are supposed to be the worst, so I wasn't unprepared, but I didn't get to the end of my pain pills so I've been rationing them and it's been pretty bad. I finally got some new pills so hopefully I will be sunshine and roses tomorrow. I just have to wait until 9:15 (in 35 minutes) to take my next round of pain pills. Anyway, I was lying in bed, just about to fall asleep this after noon, after a disastrous attempt at eating mac and cheese, when the phone rang. I ignored it but then realized it might be my doctor calling to confirm that I needed pain pills, I scrambled out of bed and grabbed the phone just as it stopped ringing. It was an unfamiliar number, so I quickly looked it up. It was some remodeling company that wants to redo our kitchen cabinets. Guess if it will ever get the job. So, disgruntled, I laid back in bed and tried to fall back asleep. It was slow going, and as my mind started to drift, I thought about all the things I was angry about. I got madder and madder until I thought I was going to burn a hole straight through my bed and crash through the floor into the living room below. So I thought I would share some so that my pain becomes yours. 1. Inapt analogies. Today, one of my friends wrote on facebook: "Claiming someone else's marriage is against your religion is like getting angry at someone for eating a donut when you are on a diet." Except that it's really not. Unless you do actually get angry, I guess. I think a more apt analogy is, "denying someone the right to marry because it's against your religion is like banning the eating of donuts because you're on a diet." Claiming that gay marriage is against your religion, when it is true is just being honest. It is like saying "Oh, I can't eat that donut because I'm on a diet." The mere act of saying that is not offensive unless you yourself want to impose your beliefs on others. I support the legalization of gay marriage for this reason. I have taken obligations upon myself, and to engage in homosexual behavior would be against my religion. But I think that the same offense I feel when I am mocked by others who would impose their beliefs on me is the same offense they feel when others block them from enjoying the same rights because of their sexual orientation. My personal belief is that the state should issue marriage licenses to any two consenting people at the age of majority who want to get married and otherwise stay out of all of it. The current "discourse" acts like there's only two options: legislate that gay is wrong or gay is right. But we can put our beliefs out there and let people choose for themselves. That's what my religion says, anyway. I want to be respected in my right to worship how, where, or what I please and I will respect others in doing the same. 2. Free-stuff complainers. The other day, Brandon and I went to a furniture store that was having a special give-away of $25 giftcards. You had to go, show that you checked in on facebook, and wait half an hour for it to be verified. It was an inefficient system, but I WAS GETTING FREE STUFF. I'M NOT GOING TO COMPLAIN BECAUSE I GOT A $25 gift card for doing basically nothing on a Saturday when I'm just hanging out anyway. But as I was looking on facebook to find out information about the giveaway, I saw a million whiner posts. One was even like, "I can't believe we only got a $25 giftcard." Seriously? they're a business--they can't just give their stuff away, and anyway, a $25 giftcard from them is better than a punch in the nose from me, which is what I feel like giving you. I am saving up my giftcard along with other funds, and when I purchase my furniture it will be $25 off. That's not $500 off but I'm still really happy with it. Other times, Ruby Tuesday will give away free stuff. I love it. Their food is really good, and they got me hooked as a customer my giving me a free burger and sides. You have to go through a little process to get the coupon, but I've never had trouble with it. Not so for the hundreds of people who complain every time they get a coupon. "It takes too long, blah blah blah" So the first time they gave a burger for free. the second time it was free with the purchase of two drinks--which is still good. And still free. And people were freaking out about it! "you're liars" "That's not really free." It was very clear on the coupon that you had to buy two drinks and again YOU'RE GETTING STUFF FOR FREE. STOP WHINING ABOUT IT. 3. Marriage deniers. I was trying to think of a snappy name for this, but that was the best I could do. As I was going into surgery the other day, an anesthetist popped in to tell me how it was going to go down. He was asking me basic questions and then said, "You are much too young to be married." This is not the first time or the fifth time that someone has said that to me, but I still don't know how to respond. Brandon was right there in the room. Maybe I should have been like, "Oh my gosh! I didn't realize it until right this moment, but you're right! I've made a horrible mistake! As soon as this is over we're getting a divorce!" There's a horrible voice at the back of my head that thinks maybe this was just a "no, older than you want to be person, you're still young!" but I have to call too young on that one, or get a lot of therapy. When I told people I was getting married to Brandon, so many of the people that I admired at school were terribly disappointed in me, asking if I was pregnant, why am I doing this, etc. I guess marriage is code for giving up on all academic pursuits and stuff. Maybe I should say I'm a lawyer when they say that. I kind of like the freak out, instant-divorce approach, though, except I would never joke about that because I do actually like being married. Despite being so incredibly, sickeningly young. 4. Shooters were "bullied" into it. This one makes me so angry. There was a school shooting yesterday in Chardon, Ohio (which is in our stake!). Five people were shot and three have since died. And people are like, well his parents got arrested for domestic violencing each other when he was two so that must be why he did it! They also claim he got bulled. Guess what? I got bullied when I was a kid. It was horrible. In kindergarten there was a girl named Heather who would say mean things to me and pinch me. She pinched me even harder after I went to a teacher for help. In elementary school I was teased for my weight, and another girl, named Heather incidentally (guess what name is not on our short list for future kids?) would track me down at recess, push me to the ground and rub snow in my face every day. I thought I would suffocate! I was teased for having a broken arm, for my early-onset acne. When I was in eighth grade, I don't know if there was some sort of pact or something, but it was really bad. There was a boy who would flat tire me every single day after gym. The worst was probably that I got a big puffy blue coat from Old Navy. It was expensive and I so badly wanted to fit in. I would wear it and feel so fashionable. But then after school, this boy would find me and he would start pushing me while I was wearing the coat. There was a big circle of cheerleaders and popular kids and he would push me around in front of them and they would all laugh. It happened a couple times and I went to the vice principal who was really mean and said I better not be falsely accusing somebody. So anyway, that was painful to write, but I feel like I have serious street cred as a former bullied person. And guess what happened? I never took a gun to school and shot up a bunch of people. I grew up and I learned to overcome that stuff. There's a part of me that is still really sad and still really hurts when I write that, but the fact is that things got much better when I went to high school (though I was teased for going to the "wrong" high school for the first little while). And things changed in 8th grade, after my disastrous interview with the vice principal. I was walking with my friends, and the flat-tire idiot was at it again. I stopped walking and let myself fall back in line with him and in front of everyone demanded, "What is your problem? Do you have something you want to say to me?" And he never bothered me again. That was the moment that I stopped being a bullying victim. I stopped being shy (I had been so painfully shy that even my teachers would make fun of me). It is one of the moments in my life that I am most proud of. I have never responded to bullying as a victim again. But to claim that bullying makes people do terrible things ignores the fact that we all have our own choices to make. and 99% of the people who get bullied NEVER shoot up a school or workplace. I don't blame or credit bullying for anything I do, good or bad. I don't blame my parents for my behavior, good or bad. I am responsible for my own behavior, regardless of my background. No matter where I am in life, I can be doing better. I hope that other bullying victims feel the same way because ultimately we are all responsible for our own happiness. So to look at this idiot who shot up his school as some kind of anti-martyr really bothers me. Sure, he may not have had a healthy or happy home life. Sure, he may have been bullied in school. But guess what? nobody pulled that trigger but him. When you're 17 you're responsible for knowing that killing people is wrong. I won't feel sorry for him and I am not sorry for judging him. Defending him as "being pushed to the edge by bullying" makes bullying victims seem incapable of handling adversity, when the actual truth is that the vast majority handle immense adversity and grow up to be strong, capable adults. As someone who suffered serious bullying while suffering from severe anxiety and depression, I know exactly how hard it is to experience but also how possible it is to get through it, without having to kill anyone. Whew. I feel better now, and I'm all complaining-ed out. I took a vicodin about ten minutes ago so hopefully that will help a little, too. I just published this with only a title. So this is my second attempt. So...I have some health problems right now, one of which is that I have bad sore throats all the time. I had a couple months off toward the end of the year, but since starting teaching the 5 year olds in primary, (maybe it's not fair to blame the five year olds--especially to their faces like I did in sunday school last week) I had one serious sore throat/cold thing in January and in early February, I actually contracted strep throat for the first time since I was five. My tonsils kept getting huge every time I would get sick. They would be soo sore and I couldn't breathe or eat or anything with them. I started having Brandon take pictures of all my tonsillitis infections so I could show my doctor eventually. So this is January. I think I should eventually publish a calendar of my monthly infections. This is strep throat in February. You can see the white patches and the big, swollen tonsils. They're really not as disgusting as you can find on google images, but I don't advocate searching for them. So after I got diagnosed with strep, I went to the doctor and she agreed that my tonsils were big and that given my history of frequent tonsillitis, they had to go. Also, this picture looks like I have some sort of freaky dead alien mouth. so my doctor said that I should have my tonsils out. But there was a catch: she is eight months pregnant, and was about to leave on maternity leave within a month. So I had to schedule the surgery right away. At the same time, out of the blue, my temp legal employment agency called me for the first time in months and said that I had a job on Tuesday and Wednesday of this week. THEN--the doctor's office called and said that she could only do it on 9am on this Wednesday! So I had to make a decision. The tonsils came out!! (Also the job got delayed anyway so it wasn't going to even start until Wednesday. this is the first post-surgery picture. My uvula is totally enormous!! It's big and slimy and has blood on the tip. I can feel it touching my tongue and sometimes it flips back and forth. I can't sleep on my back because I feel like I'm suffocating. I have to sleep on my side. I also get freaked out when I eat because I can't tell if there's food stuck in my mouth or if it's just my uvula and stitches. My stitches should dissolve in 6-10 days at which time my recovery should be complete. You can see my stitches a little bit inside my mouth. now the rest of my mouth swelled up. it's super tight in there right now. also my lips look weird in this picture. So my mouth is all bloody and big inside. So I feel a little better today compared to yesterday. The surgery went well and I didn't bleed as much as they thought I would. I tested a little bit high on my coagulation factors, which might have indicated that I could have bled too much. I had the coagulation test on Tuesday, but I didn't hear back on the results. I needed to do okay on the coagulation test in order to have the surgery, so even though I went into the hospital on Wednesday morning, I wasn't a hundred percent sure I was actually getting my tonsils out. Which made it all even more stressful! So I went into the hospital and they had me wear a gown and tuck into a bed. I wore grippy slipper socks but my feet were still really freezing. I had a little tv in my room and Brandon and I watched Will & Grace while he held my feet to try to warm them up. I was super nervous. They came in about an hour before my surgery and indicated that my coagulation was okay so they were going to go ahead. I cried when they left because I was super scared. They hooked me up to an IV and pumped in a bunch of "gatorade" stuff. I was still really hungry. My IV hurt because it only had gatorade instead of pain medication. Also, there were air bubbles in the gatorade as it was flowing in and I wondered if you really died if you got air bubbles in your IV. Apparently not. I was crying again soon and asked Brandon to please not make me go. He said he wouldn't make me go, but if I didn't want to any more, he would still make me go. Finally a nurse came in about a half hour after I was supposed to be starting my surgery. She pumped in three syringes of sedative into my IV. Less than a minute later I was laughing so hard I was crying. I had the giggles and that made Brandon laugh. They wheeled me out in my bed and took me to the operating room. The lights were different than they are on tv and movies, they were still round and stainless steel with lots of bulbs, but the bulbs were redder and not as round. They told me to move onto another bed, but I couldn't understand what they meant. They helped me as I slowly figured out what they wanted. Things were getting blurry around the periphery of my eyes and that's the last thing I remember. I woke up in the recovery room. I could hear the nurses talking about me and my really awesome 3 month period. They were going to refer me to the doctor that I already go to because they thought I had fibroids which the doctor I already go to has already ruled out. I felt annoyed but I mainly wanted to wake up so I could see Brandon and go home. I tried to talk or indicate to them that I was awake. They told me to be quiet (but not in a mean way). They asked me about my pain and I said it was bad. It wasn't really that bad I don't think. It just feels like strep throat--which is pretty painful, but apparently not like childbirth. She gave me some pain meds and after a little while I could sit up. I still felt tired but I wanted to leave. I talked to the nurse for a while--my voice didn't hurt so bad then. There was an old man across the room who was also awake and talking. He got some hot coffee. I wanted hot chocolate but I couldn't have anything yet. Finally I got some ice chips. They were really good and I ate all of them. I was supposed to go back to the room where they got me ready, but I was doing really well. I told them I wanted to go home and sleep so they brought over my clothes. I was super shaky and I thought I was going to fall over but I didn't want them to keep me longer so I tried to keep it together. They had these weird blood pressure cuff things on my legs that would squeeze them so I didn't have an embolism, but I thought that was excessive for a 45-minute surgery. I also had one on my arm that would squeeze every five minutes or so. I got dressed but even that slight movement made me feel real nauseous. I also found a sticky patch on my chest that had the tongue part of a snap closure on it. I took it off. They went off and told Brandon to get the car and a guy named Alan came with a wheelchair and took me out. Any movement made me super nauseous. I wanted a Shamrock shake and some water from McDonalds on the way home. The shamrock shake ended up hurting though because it was too sweet. Brandon got a hamburger. I really wanted one too, but I wanted to not rip my throat open more, so I contented myself with a little sip of shake and some ice water. At home I took a long nap, along with Greta and eventually Brandon. I found four more of the sticky patches on my arms and legs. I wonder if they take off your gown when you're in surgery and use those to attach cover-ups for your private parts. At any rate, I felt like I was on the Matrix. I slept and slept and would wake up in a lot of pain (again, essentially strep throat). I'd take some percoset. I can't really swallow pills right now so I have to have them mashed up in some sort of jelly. So far, applesauce and chocolate pudding have been totally ruined for me by this method. Note to self: if you're going to secretly drug someone, don't use percocet because it tastes HORRIBLE no matter what you do to try to hide it. I stopped taking my drugs last night because I was being a little irrational--my doctor said I didn't have to wake up to take my drugs just to keep on schedule, so even though I did wake up at about the right time to redose, I still didn't take any. Oh, last night for dinner I ate a ton of lipton chicken noodle soup. Brandon would make it and i would pour out all the broth and put in a bunch of ice cubes to cool it off and then eat it cold. It sounds gross but it was actually amazingly good. They say you lose on average 10 pounds from a tonsillectomy and I can see why. I'm tired and the only thing that really goes down that well is ice and applesauce. I drink a bunch of low-calorie gatorade but so far I've had a little uner a quart of that and around one cup of applesauce today. I'm hungry now but generally this is enough to keep me going since I'm sleeping all the time. Today, Jenn Bang from the ward brought a huge thing of pasta for Brandon. I asked her if she could help us out, and it was so sweet of her to come through on such short notice. Especially since I couldn't even talk to her when she came. Thanks to Marinda, I found out our blog had disappeared!! This wasn't a weird social statement that we didn't want to be offensive to people anymore or anything--Brandon was doing something with our website, and I'm still not clear what it was, but at any rate it was gone and now it's back! !